~Eternal Snow~: Japan Day 3: Washinomiya Jinja. A 700 yen, 1hr 15mins journey towards the small town of Washinomiya, in the Saitama Prefecture, was definitely worth it despite the rain which fell on this day. 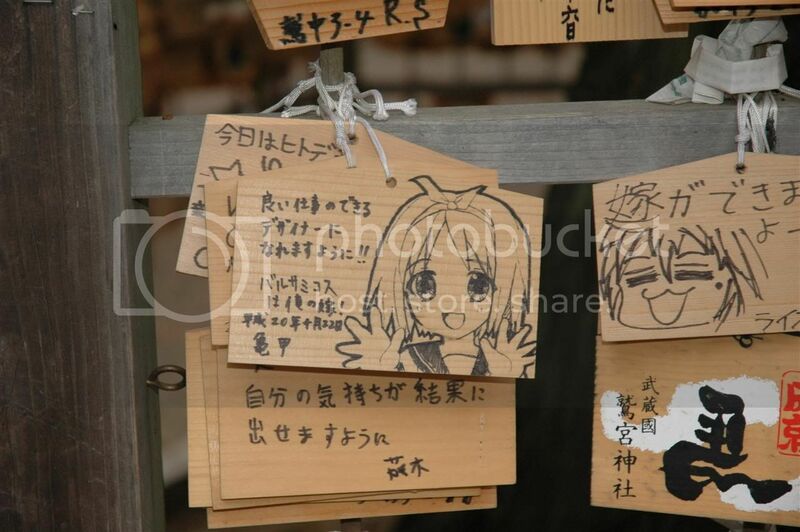 I went to visit the "workplace" of our beloved Hiiragi twins from Lucky☆Star, Washinomiya Jinja. Well, I was so excited over visiting the place, till the fact that I forgot to take a photo of the infamous entrance to the shrine -.-", so here's the anime version of it!! 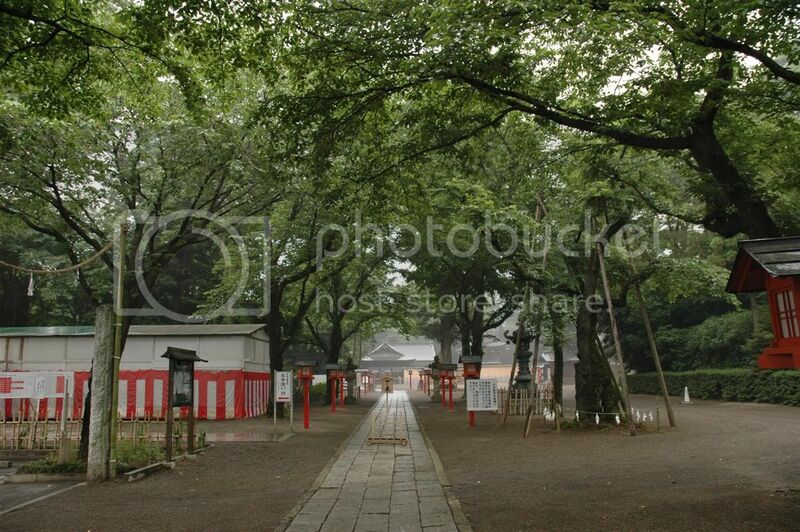 Once past the torii gate, it's a small pathway towards the main shrine. 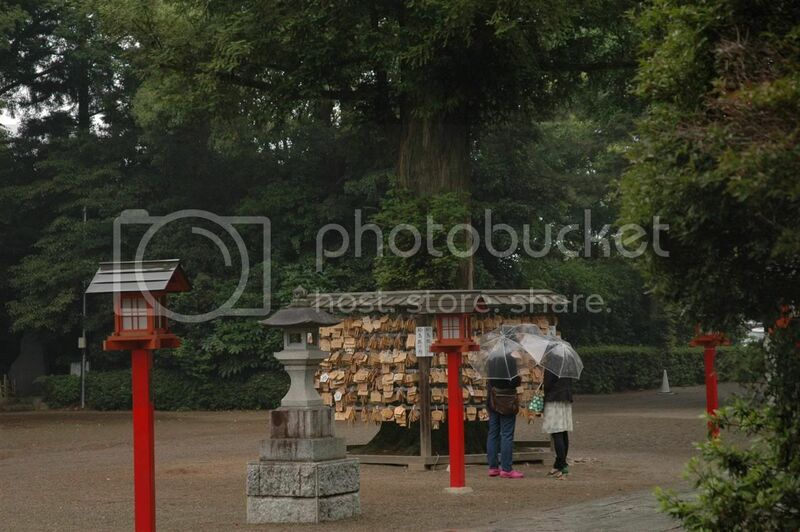 Since it was a weekday and the fact that it was raining, there was hardly anybody around. 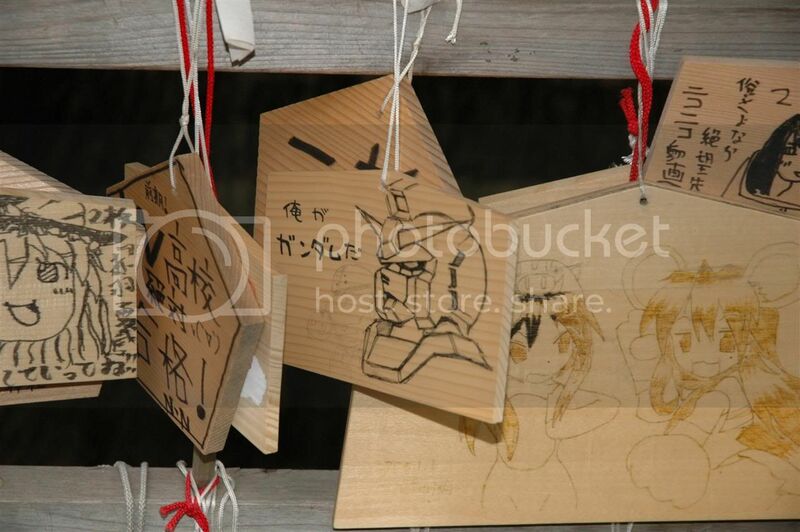 Some visitors taking a look at the ema plaques. I'll come to the ema later. 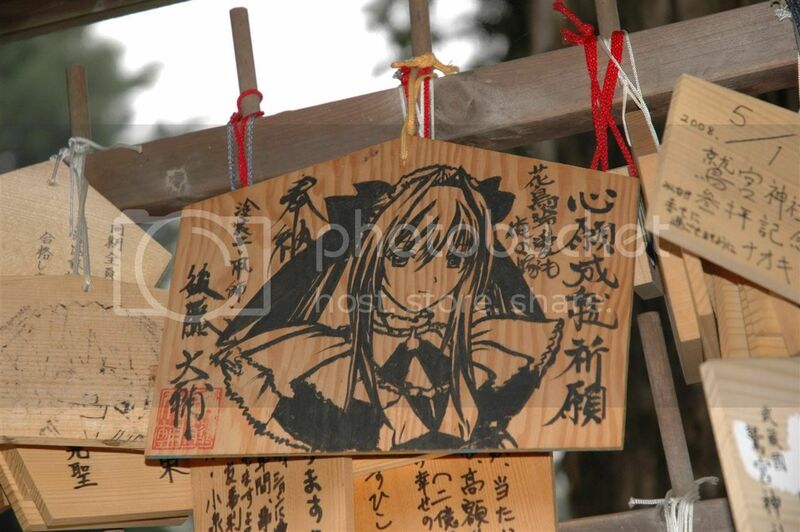 Once making a wish, I went to buy a ema... which costed 1,000 yen??? Wow they sure know how to leech money lol. 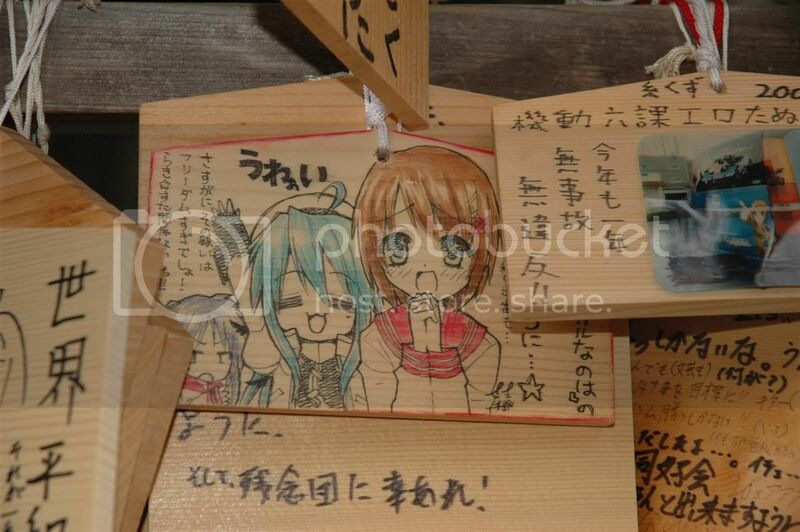 Anyway, here's my ema which is to the left of the Miku one (you should know why I had it placed here ^^). I realised upon seeing my photos, that I actually miswrote "blog" as ブロク instead of ブログ, I forgot the extra " at the top of ク -.-"; I also noticed the last part of my last sentence was abit weird, I swear I didn't know what was going through my mind when I wrote that (なはいい?? What the hell is that?). 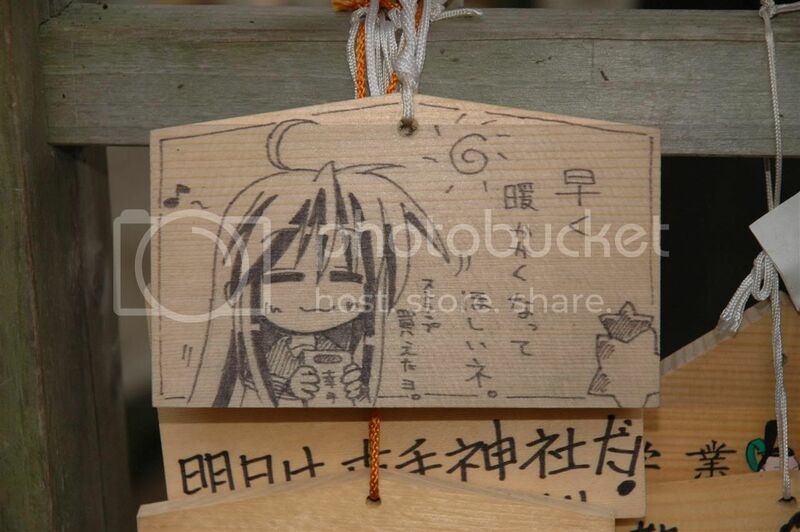 I think it was supposed to be without the な in it. Anyway, the rest of the ema below are ones which I found that were quite nice; in fact there were too many nice ones that I had to be selective, but here are the chosen ones. 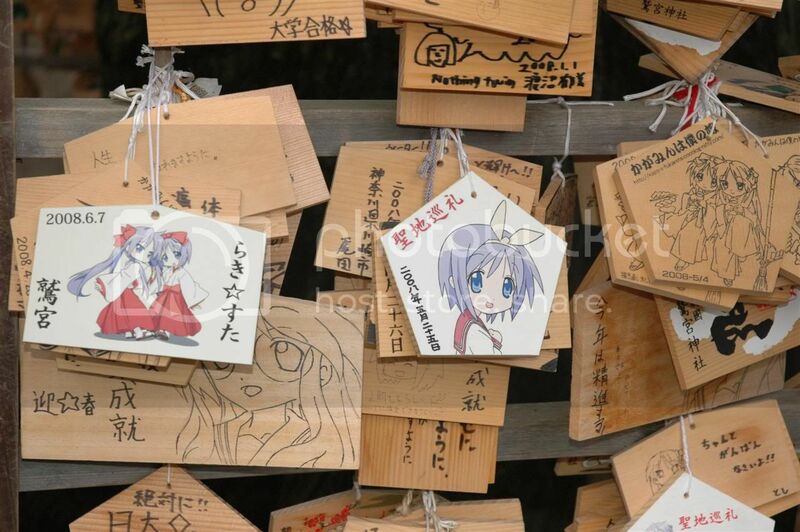 Tsukasa and Kagami ^^. This plaque was huge!! It is about the size of 6 normal emas pieced together. A couple of really good ones placed together. I suspect they were all from the same group or a single person. The shading techniques looked the same, and there was some numbering system on them all. Kona-chan x Kagamin ラブ ^^. Another batch shot of emas. Spotted 2 Korean ones! 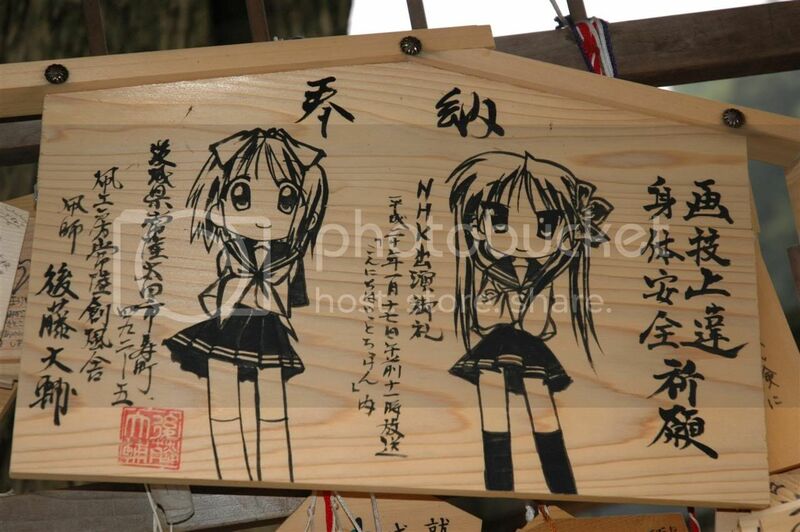 Couldn't find any English plaques around though, maybe I should have did mine in English -.-"
There were some emas, instead of actual writing with a marker on it, the person had already pre-printed the image and words on sticker paper, and came to paste it on the board. Pretty nice too. The one of the left is pre-printed, while the one on the right seems to be hand-drawn. Very very close to the original. 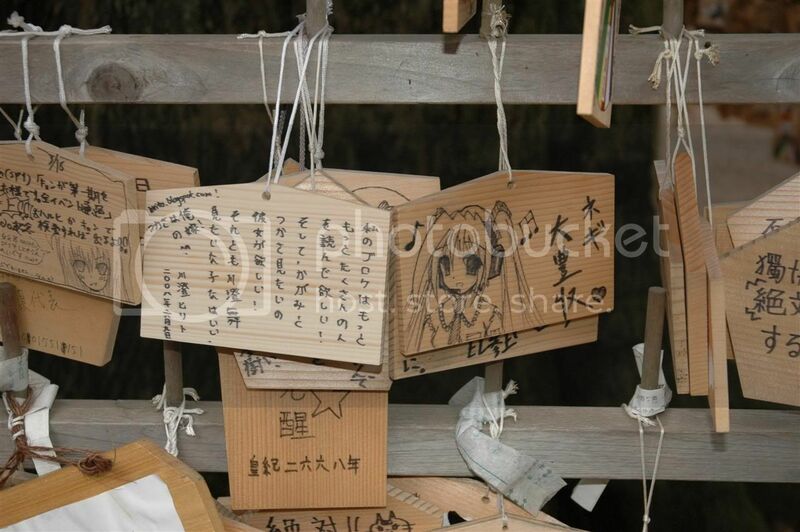 As for the website on the left ema, I visited the site, and it seems that the guy is a regular visitor to the shrine, making new boards every now and then and putting it up. To save you all the trouble of typing that webby, let me hotlink it here for you. 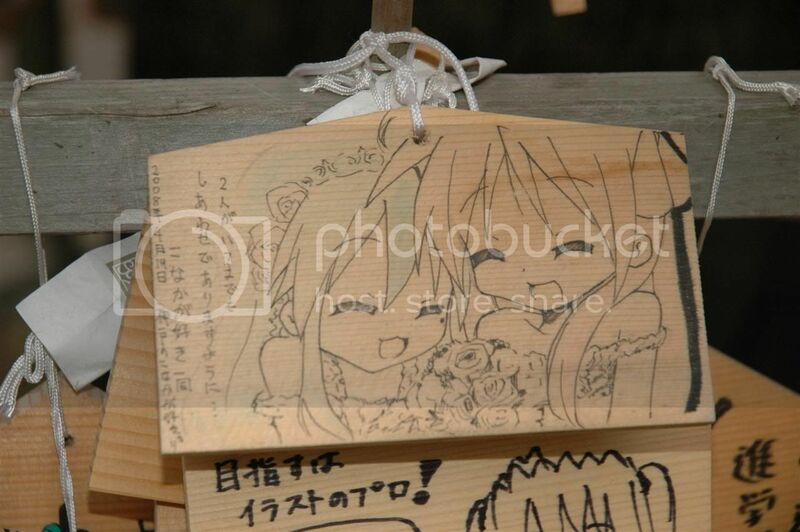 Has very nice photos of various emas too. I would say this was my favourite ema of all. A really moeliciously cute Kagamin and Tsukasa together. Too bad it was located right at the bottom corner. Prayer for a good job(?). I'll need one too in like 3-5 years time once I'm done with studies. Patty Moe and Peace!! The main cast all together. Another Kona-chan x Kagamin ema. ラブ ラブ!! Why wish for warm weather?? And here I am wishing for cold weather -.- We need to change places/countries instead ^^. 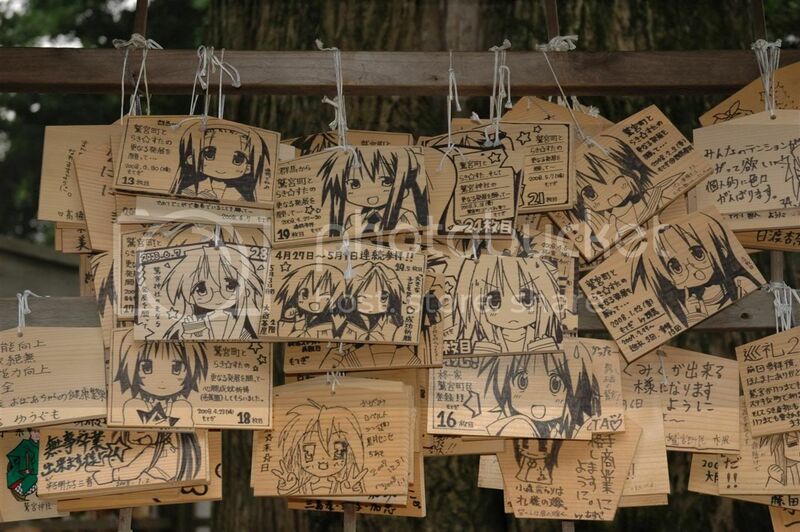 Being a "designated anime" shrine (LOL), it was also invaded by other animes. 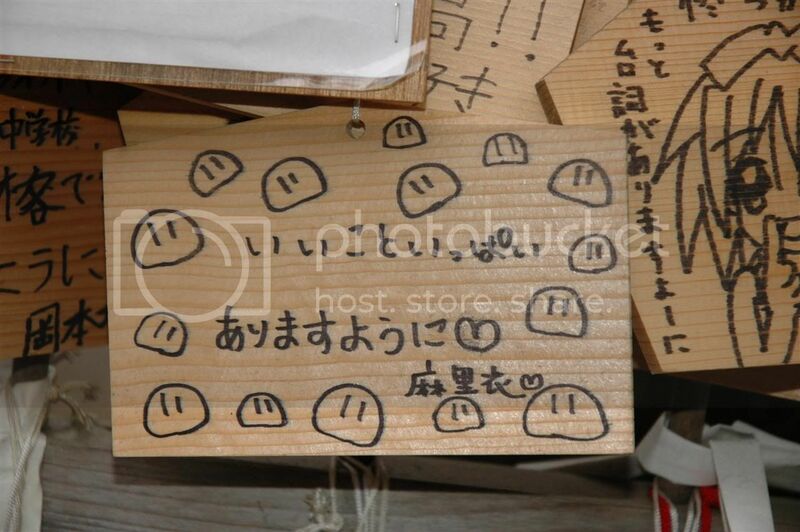 Here's the Dango Daikazoku. I have no idea who's this character though, but was one of the better artworks around, deserves to be posted. I basically ROFLed myself to death on this. Setsuna F. Seiei from Gundam 00 reference. That's about it for the emas. 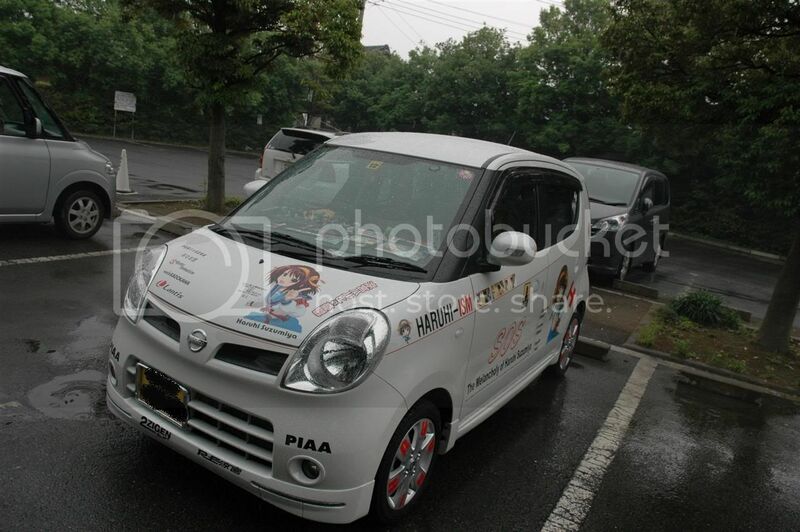 I actually spotted this Haruhi Itasha being droven while walking towards the shrine, but waited till I was leaving to take some photos of it, since I found it at the carpark on my way out. 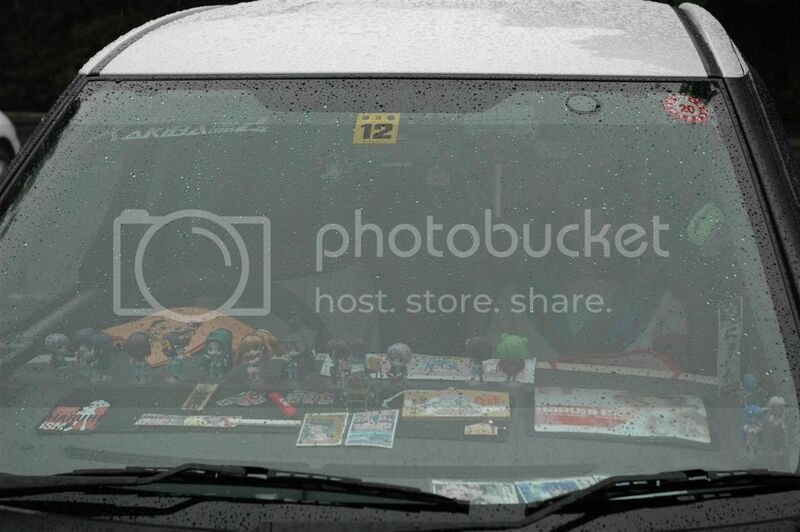 The dashboard is littered with Haruhi related stuff. 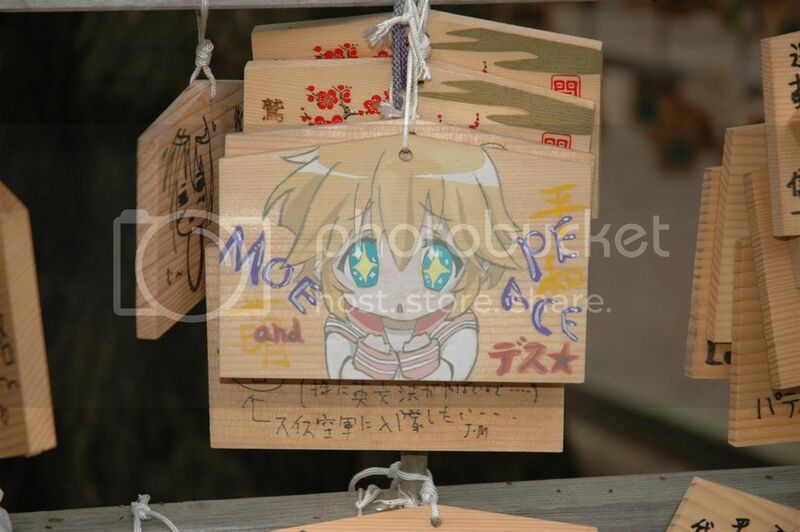 Nendoroid Petit Haruhi set spotted!! 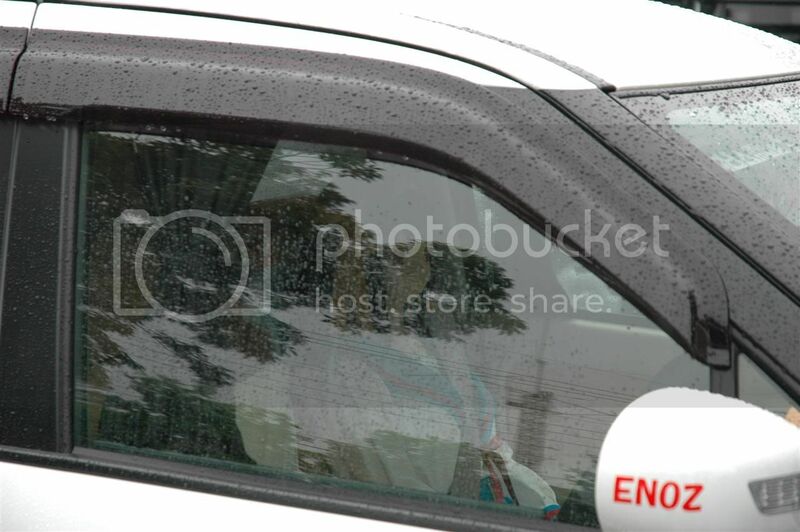 And if you didn't noticed, there's a Haruhi Papermoon doll in the passenger seat. 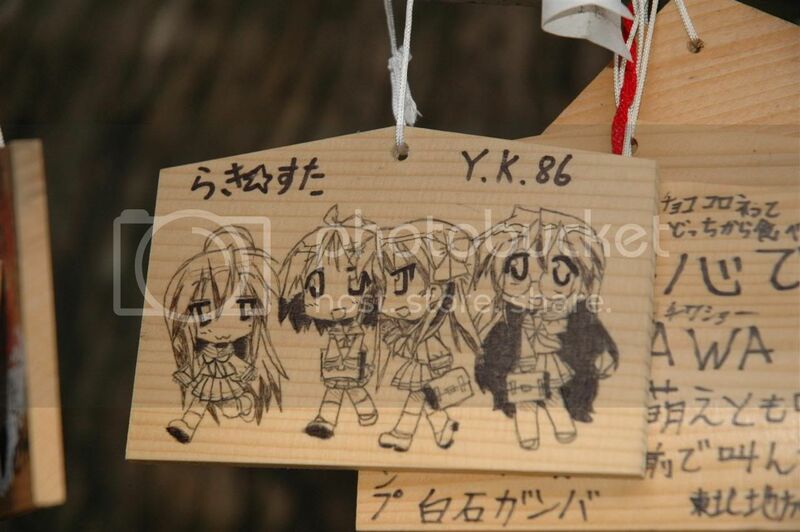 That would have costed him 380,000 yen... rich! But if he could afford a car and even itasha it, I guess he would have the money anyway. 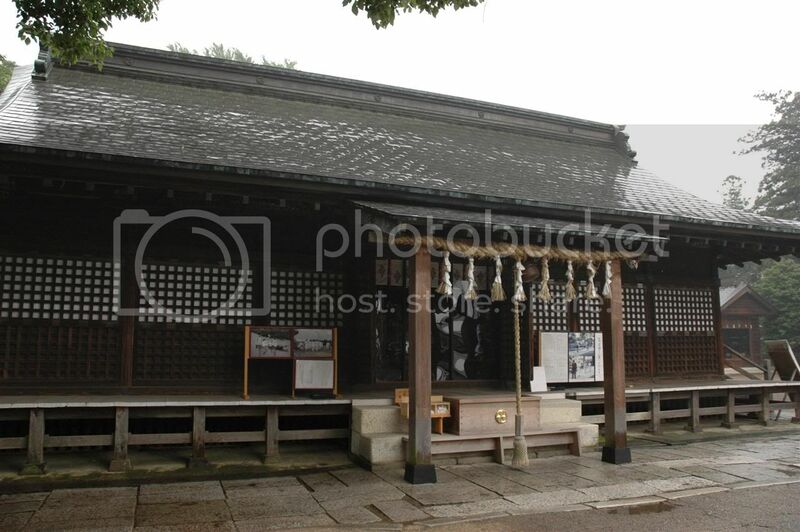 In front of the torii gate, entrance to the shrine, on the right side, there's a rest house there where you can have a light snack. 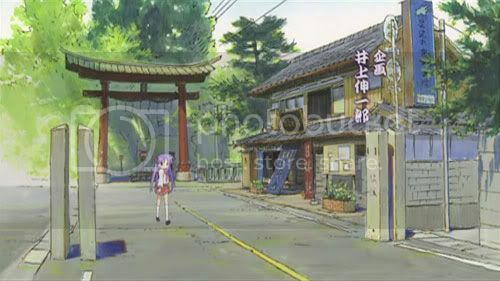 And yes the rest house looks like the one in the OP too. 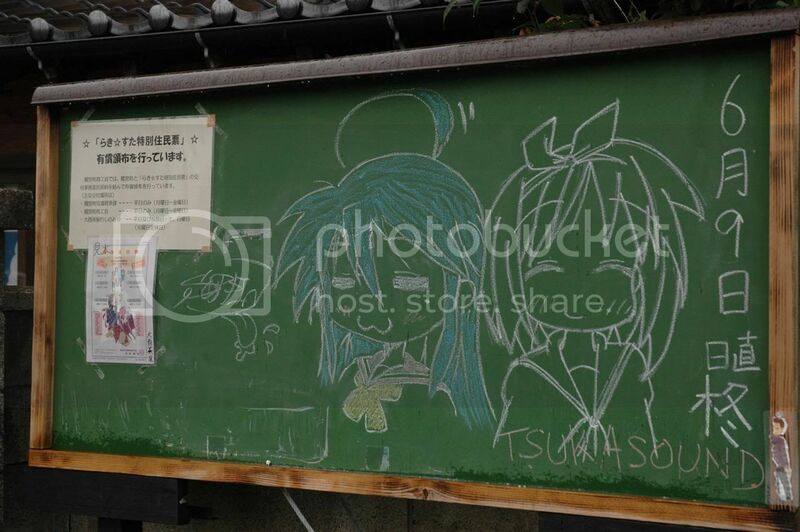 This chalkboard was just outside of it, cute art ^^. This seems to be a permanent fixture in front of the rest house. I want to take it home!! お持ち帰りたい!! 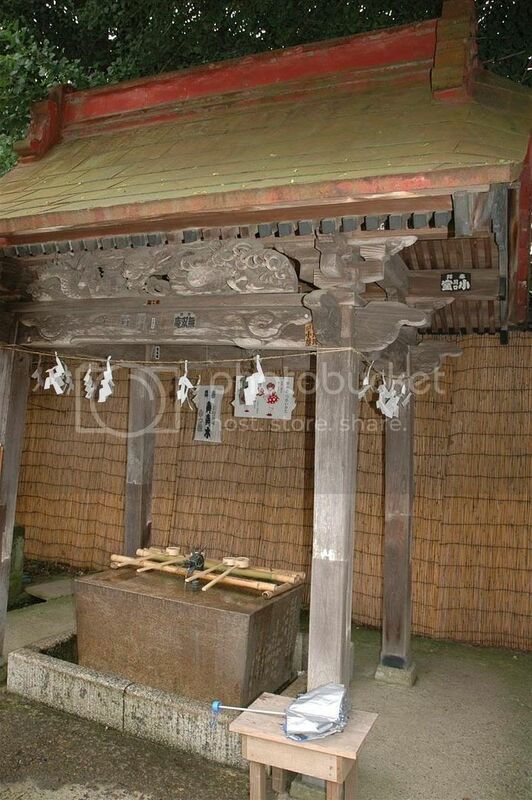 That's about it for Washinomiya Jinja. The rest of the day was covered with rain, and I didn't want to risk having my camera soaked while trying to capture photos of the city (we only went Ikebukuro later in the day). Risking my camera here was another thing, I'll be a waste if I came all the way and didn't take a photo, so yea I was taking photos in the rain without an umbrella, good thing it was only a light shower. I'll be taking a break from posting tomorrow, since I'll be occupied for most of the day; with our Team Blue "One with Nature" Figure Photoshoot tomorrow afternoon, a NTU hall recommendation interview in the evening, and a meet up with some BMT Kestrel June 06' platoon-mates for a BBQ at night. Here's wishing you all a enjoyable weekend!! Signing out. P.S: I'll like to put a thanks out to Zyl from hontou ni sou omou? for his pioneer L☆S Pilgrimage trip, which was used as reference for the trainlines towards the small town of Washinomiya. Thanks ^^. 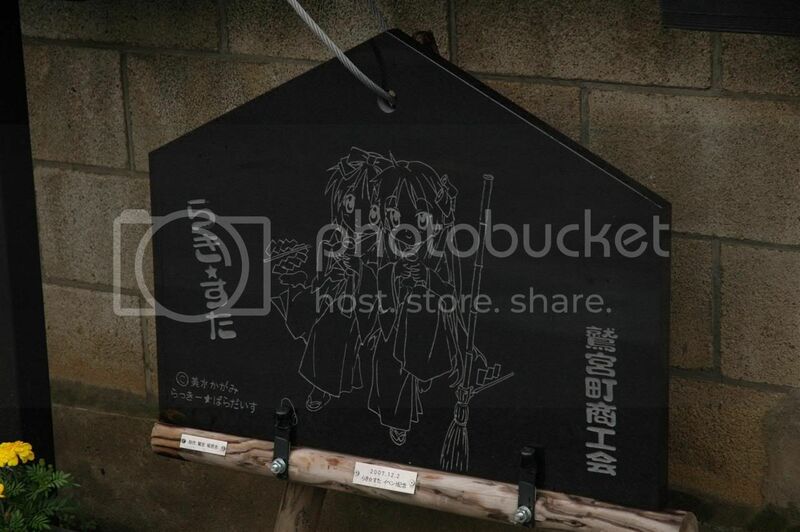 (I have no idea how to do a pingback to the post though -.-") Hope to be able to do the complete pilgrimage in the future, going with a non-otaku friend is boring when it comes to these kind of stuff. 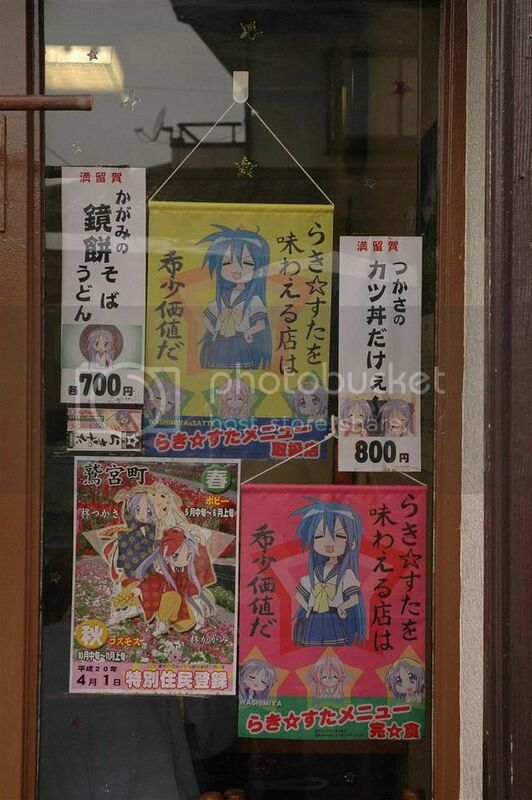 That Tsukasa one is Thai ,not Indian. But it's still wrong in spelling and word using. 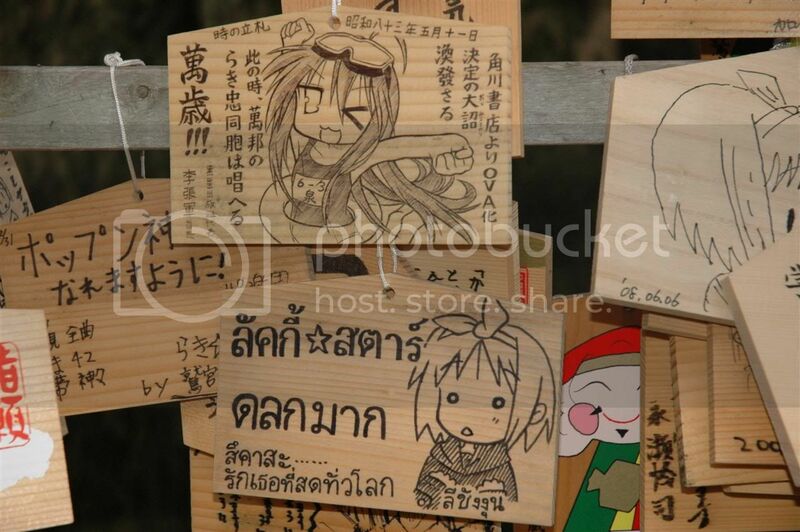 The Proper one is " ลัคกี้ สตาร์ ตลกมาก สึคาสะ รักเธอที่สุดในโลก"
Meaning is " LuckyStar is very funny. Love Tsukasa most in the world"
Also , Sorry about my improper English. I'll be going in August!!!!!! Got any directions on how to get there from Akibahara. anonymous: Thanks for the correction ^^. rin: From Akihabara, take the Tokyo Metro Hibiya Subway Line to Kita-Senju (Or take all the way to Tobu-dobutsu-koen), then change to the Tobu Isesaki Line towards Kuki (or beyond, depends on where the train stops at), Washinomiya is one stop away from Kuki anyway. 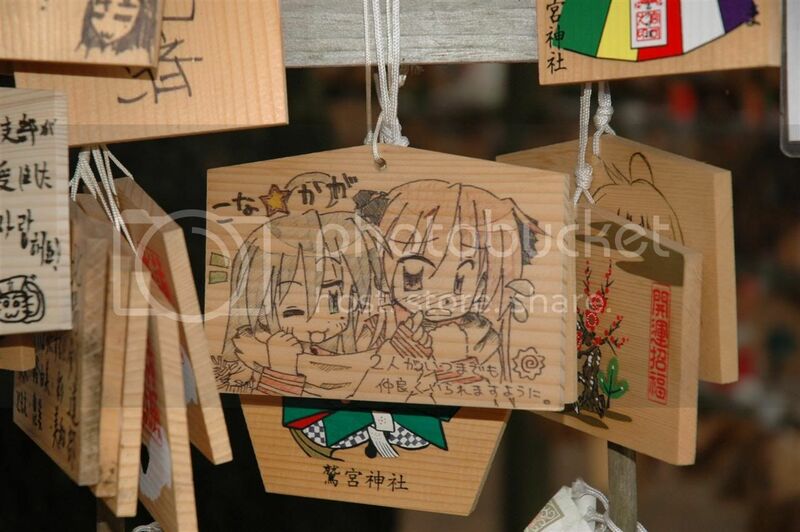 For a more comprehensive guide to the Lucky Star Pilgrimage, be sure to read Zyl's post as it covers most of the spots. 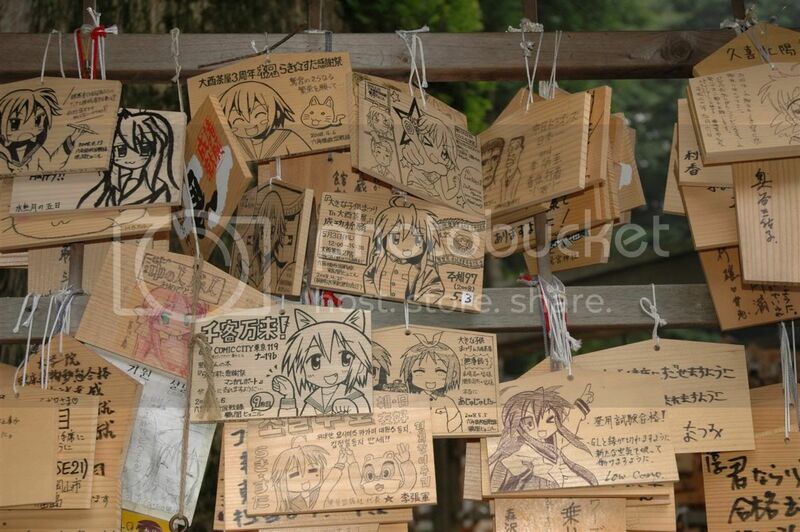 Rather than ema plaques, it looks more like an image board to me. 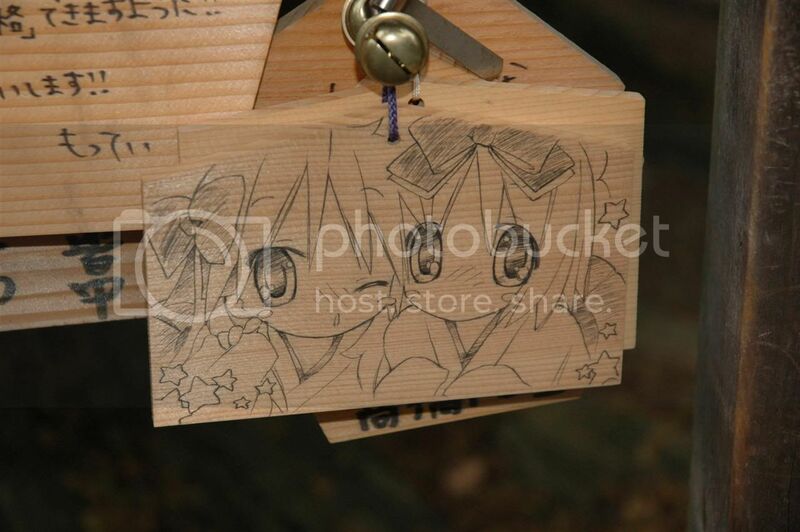 ^^; Would love to visit this shrine someday. And thanks also for posting your wonderful photos! It looks like such a great atmosphere at Washinomiya... I'd love to visit it again!! 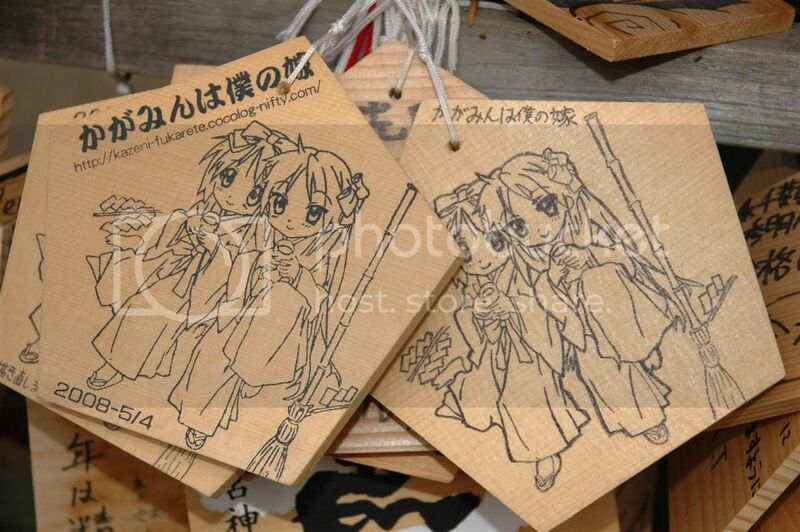 mizunaga: quite true, since rather than having wishes, they're giving images lol. zyl: No problem ^^, it was very very useful. If I get the chance to do the complete trip, I'll definitely make use of your post again. It'll definitely be nice to visit again, and even better if you have fellow LS fanboys going along, it'll sure be one hell of fun!